Ancient voyages to America - Who were the first explorers? Who were the first people to discover America? Historical evidence uncovers the myth of Christopher Columbus being the first to America. This documentary explores the evidence of Ancient Civilizations visiting North America long before Columbus. Chinese, Egyptian, Viking explorers all traveled to the New World. It may look like a work of art at first glance, but this is the amazing image that reveals the past 170 of hurricanes around the globe. Produced by the U.S. National Oceanic and Atmospheric Administration, it reveals exactly where in the world is worst hit. 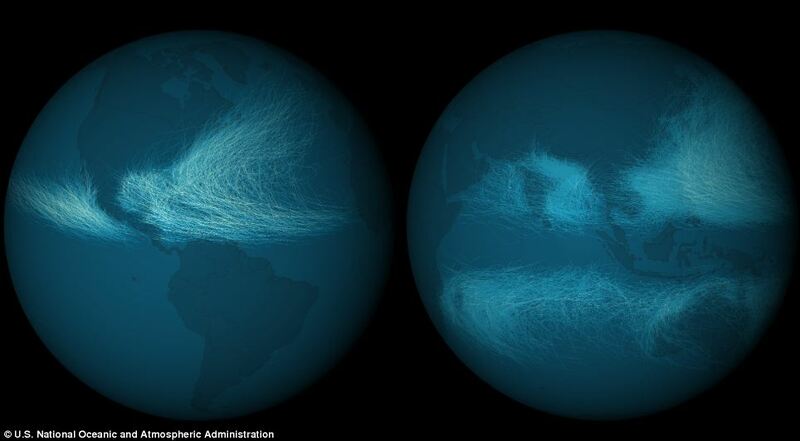 The image charts 11,967 tropical cyclones that have occurred on Earth since the NOAA began keeping a record in 1842, when data was supplied by ships and lighthouses rather than today’s advanced satellite detection systems. Interactive map: Using the map on the right hand-side, zoom in on a particular location or zoom out to see a global view. You can then click on the 'Hurricanes' or 'Country Strikes' tabs on the top right to view the frequency and path of all hurricanes in that particular area. The key on the top right corresponds to hurricane strength and the number of hits in that area since 1842. ‘Before the advent of the satellite era, hurricane tracks were constructed from ship reports – and although reliable, some storms were probably missed, the NOAA admits. ‘Geostationary satellites, such as NOAA’s GOES, revolutionised the ability of meteorologists to track cyclones,’ the map-makers explain. The group has also released an interactive map that allows you to zoom in on specific areas in the world and view hurricanes based on their frequency and path in the area. The team used colours to make patterns in the storms more obvious. By colouring how many times any storm track overlapped another, patterns arose in the density of storms affecting a given area, the team found. By colouring how many times any storm track overlapped another, certain patterns arise in the density of storms affecting a given area. Cyclone tracks overlapped the most in the western Pacific and Bay of Bengal (India), where typhoon season never ends since waters are always warm enough to sustain cyclone formation. The frequency of track overlaps is much lower in the Western Hemisphere than in the Eastern Hemisphere. They also produced a second map showing storm intensity. In contrast to the first image of frequency, the Northwestern Atlantic shows a much greater spread of strong storms, whereas in the Pacific the strongest cyclones seem to group near the Philippines. This map shows storm intensity, providing an interesting contrast to storm frequency. near New Orleans increased at a rate of 9.24 millimeters a year between 1947 and 2006 — three feet over the course of a century. Projections by the National Weather Service and the U.S. Army Corps of Engineers show that much of the five boroughs will be submerged if another strong hurricane hits New York in the year 2100. In its forthcoming report, the Intergovernmental Panel on Climate Change estimates that sea level could rise by as much as six feet by the end of the century. Thanks to rising seas brought on by global warming, New Yorkers can count on a very wet, deadly, and expensive future. Based on projections from the National Weather Service and the U.S. Army Corps of Engineers, if a storm equivalent in strength to Hurricane Sandy were to hit the five boroughs in the year 2100, vastly larger swaths of the city would be submerged. Sea levels are forecast to rise by as much as six feet before the end of the century, making low lying cities like New York all but defenseless to the wrath of powerful storms. Given the dire predictions on how fast sea level is rising, New York could face annual flood costs of $2 billion per year. In its September issue, National Geographic spoke with several experts who proposed ways to try and protect the city. Unfortunately, over the past decade, scientific projections on sea level rise have grown rapidly as more data on climate change has continued to be analyzed. Six years ago. the Intergovernmental Panel on Climate Change (IPCC) estimate that by 2100 sea level would rise by a maximum of 23 inches. In a draft of this year’s report, the final version of which is to be released this fall, the IPCC revised that outlook to a maximum of six feet. Hurricane Sandy, which killed 43 people, caused an estimated $19 billion in damages in New York. Mayor Michael Bloomberg has proposed that the city spend $19.5 billion to mount a defense against rising seas, roughly the same amount New York faced in losses as a result of Hurricane Sandy (43 people died in the city because of the storm). Whether the mayor’s plan will be embraced before he leaves office, or will be championed by his successor, remains to be seen. “Eventually the city will have to face up to this, because the problem is going to get worse,” Malcolm Bowman, a physical oceanographer at the State University of New York at Stony Brook, told National Geographic. In the absence of bold new measures, including the construction of massive storm surge barriers, the financial toll the city faces from rising sea levels in the not too distant future is more than a little daunting. A new study by Nature Climate Change estimates that New York City faces about $2 billion in annual losses from flooding in 2050. That activity is more than suspicious. Ships don’t just accidentally drift into the exclusive economic zones (EEZ) of other countries and stay there for the good part of a week. This was almost certainly a textbook case of pirate fishing: one boat without proper permits or quota heads out onto the high seas to fish, and then later transfers that catch to a legal vessel while at sea. Similar illicit activity was observed by passengers aboard the National Geographic Explorer last April. Illegal, unreported, and unregulated (IUU) fishing, also known as pirate fishing, is a massive problem across the globe. It is estimated that IUU fishing costs the industry as much as $23.5 billion per year and accounts for up to 20% of global wild marine catch, though the extent of the problem is impossible to determine. From an environmental perspective, illegal fishers are often overfishing already depleted fish stocks, using destructive gear, and sabotaging responsible fisheries management efforts. From a health and community perspective, pirate fishers are robbing subsistence harvesters and other waterfront dwellers of their livelihoods. Over one billion people, most of whom are in developing countries, rely on seafood as their primary source of protein. The word “pirate” can evoke some pretty whimsical imagery, but the reality is that pirate fishing is so convoluted and multifaceted that it defies any simple description. Activities that fall into the category of IUU fishing range from fishing above the set quota for a certain species (and failing to report it), to fishing within the EEZ of another country without permission, to violating regulations on a specific fishery, such as equipment standards, maximum trip time in a designated area, or maximum by-catch thresholds. Some pirate ships hide their identities and origins by flying a different flag or painting a fake and unregistered name on their hull. At the crux of the issue is a lack of enforcement. Beyond the inherent difficulty of policing the open ocean, an absence of global coordination perpetuates this problem. Along with weak international governance, which comprises a patchwork of authorities and regulations, there are issues of poor cooperation, whether due to limited resources or interest, in getting individual nation-states to enforce IUU regulations at their ports. This is especially the case in certain regions, such as along the west coast of Africa and around the Pacific Islands, where fish habitats are lush and the enforcement capacity of sovereign authorities is minimal or nonexistent. A few recent enforcement successes have been heartening, however. Last spring, a major tuna-fishing vessel that was suspected of illegal fishing in Liberian waters was denied access to ports in Seychelles and Mauritius, thanks in large part to a regional partnership called FISH-i: Africa. NOAA has pledged to work with ten nations with historically weak enforcement of IUU fishing, and six of these have already begun to take strong corrective actions against vessels suspected of illicit activities. Many other governmental and non-governmental entities have begun to make combating illegal fishing a priority, as global fish stocks decline and profits to be made by illegal fishers grow. Some of the remaining difficulty comes down to a lack of surveillance capacity, which is where new technology solutions could prove to be game-changers in combating IUU fishing. One such technology called MarInt, created by an Israel-based company named Windward, was initially developed for enforcement and security-related maritime concerns, but is now also being used to identify suspicious behavior on the high seas. MarInt uses commercial satellites to continuously monitor the movements of all seagoing vessels all over the world at all times—an ability that has never before been possible on a commercial level. More important, using algorithms, MarInt can analyze the behavior of those vessels in real time, and pinpoint the ones that behave suspiciously. Demo of MarInt- illustrating its key analytical capabilities implemented in a real environment in the South China Sea. The demo showcases MarInt’s key abilities: open source intelligence conflicts, behavior analysis, discrepancy analysis and SAR to SAR contextual analysis. The system not only monitors a vessel’s location, but it can also show all of its identifying information, the path it’s traveled since leaving port, and other vessels in its fleet. 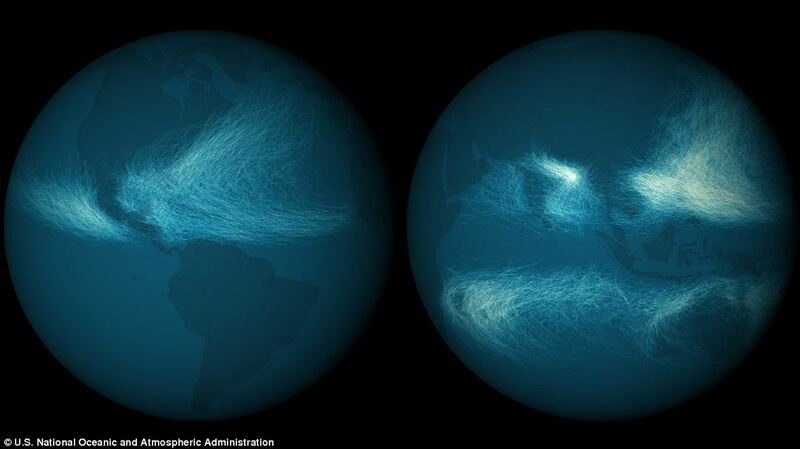 It can even predict where the vessel will go next, based on historical data and ocean currents. And it does that not only for fishing vessels, but also for the reefers and gas tankers that enable their activities. That information allows MarInt users to see the exact origins of the fish carried by fishing vessels and reefers into ports all over the world, bringing new levels of clarity and traceability to the fishing industry. Regardless of how it’s accomplished, increased clarity and traceability will yield benefits to everyone in the supply chain, from fisher to consumer. By being able to verify when, where, how, and by whom fish are caught, port authorities can deny entry to pirate fishing ships; suppliers can ensure there are no illegal fish in their inventories; consumers can be confident in the health, safety, and legality of the fish they’re purchasing; fishers and waterfront economies in developing countries can gain stability; and depleted fisheries can begin to rebuild. Russia is planning huge oil and gas developments in the Arctic Ocean off its northern coast - drilling that could threaten pristine wildlife habitats. Large-scale production could begin in the next two decades, if the price of oil rises high enough. Preliminary exploration has already begun, including in the Laptev Sea. 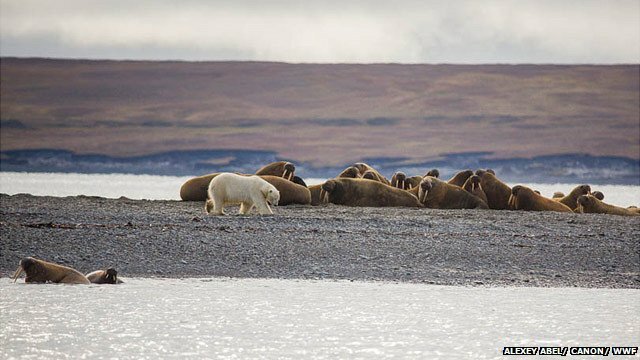 But scientists say the region is home to important, thriving populations of walrus and polar bears, which could be put at risk. Biologists on the 2013 Laptev Expedition this summer have been trying to establish if the walruses and polar bears there are a unique group, in need of special protection. BBC journalists went with them to investigate the issue. We flew to Khatanga, one of the most northerly towns in Siberia, and there we boarded a small boat, the Taimyr. After the first day it became clear we had entered the domain of the polar bear. First we saw a mother with two five-month-old cubs on Maliy Begichev Island. Then we saw a big "haul-out" of walrus at Cape Tsvetkov - perhaps 400-600 there, resting on the beach. Towering above them on the last large lump of ice was a large polar bear. But our destination was Maria Pronchishcheva Bay, half-way up the Taimyr Peninsula. It is the most northerly bit of land in the world still attached to a continent. "The oil companies are coming here with exploration projects already, and there are ongoing seismic explorations," said Igor Chestin, chief executive of the environmental group WWF Russia. "So before the real oil and gas projects develop in the area we need to know that there is sufficient knowledge of the conservation needs here, which would allow us to put in the necessary protection if this development ever happens." From satellite photographs taken a week earlier, the scientists on the expedition knew there had also been a large walrus "haul-out" there previously. By the time we sailed into the bay the number had dropped to around 60. But it was still enough for the crucial scientific work of the expedition - collecting DNA from the Laptev walrus. 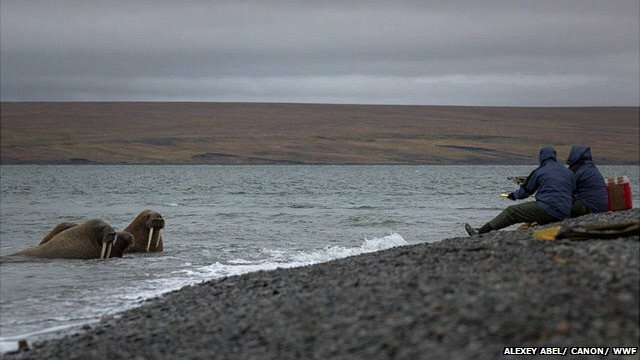 Walrus expert Anatoly Kochnev of ChukotTINRO, a marine biology group, was despatched to the pebbly spit where the animals were resting. We watched as he fired crossbow darts into the sides of the walrus, which he then retrieved with a thin piece of line attached to each dart. At the head of each dart was a biopsy punch, which pulled out a piece of walrus skin and fat as it was retrieved. The samples will be sent to labs in Moscow and Denmark for DNA analysis. The plan is to end a long scientific dispute over whether the Laptev walrus is a unique sub-species in need of special protection, genetically different from the Pacific walrus and the Atlantic walrus. Just one hour after Anatoly Kochnev's third trip out to the spit, a huge male polar bear appeared in the exact spot where he had been kneeling to fire the crossbow. The bear tried to kill one of the walrus, but was unsuccessful - this time. Polar bear expert Geoff York of WWF's Global Arctic Programme is collecting samples - faeces and hair - which will also be sent for DNA analysis. Again there is a concern that the polar bears of the Laptev Sea may be unique and in need of special protection. "If that is true then in most countries you would need to identify the habitat being used by bears," Geoff York said. "Are they making dens onshore? How are they using the land in summer? Then you would protect those habitats at least in the relevant seasons. If you do indeed have two unique sub-populations of marine mammals here you might consider that this should be a Marine Protected Area, and you might exclude any industrial development." The concern about the large marine mammals of the Laptev Sea has increased in the last decade for two reasons. Firstly, climate change has led to a dramatic shrinking of the Arctic ice cap in recent summers. This has meant that in order to stay close to their feeding grounds the walruses have had to come ashore in much larger numbers, instead of staying on the ice where they feel more comfortable. Polar bears are also being forced ashore, where they find it much harder to feed. Their preferred meal, the ringed seal, is not available onshore and they often are reduced to going after the much more dangerous walrus. Secondly, there are plans to develop the Laptev Sea for oil and gas production. The water here is shallow, which makes it easier to drill, and there are believed to be large deposits of hydrocarbons. This exploration work may frighten the nervous bear and walruses, and could disrupt their food supply. Conservationists think the arrival of much greater numbers of humans could also increase hunting, further disrupting the delicate balance of nature here. They say that nobody has yet worked out how to control an oil spill in seas that are close to freezing. 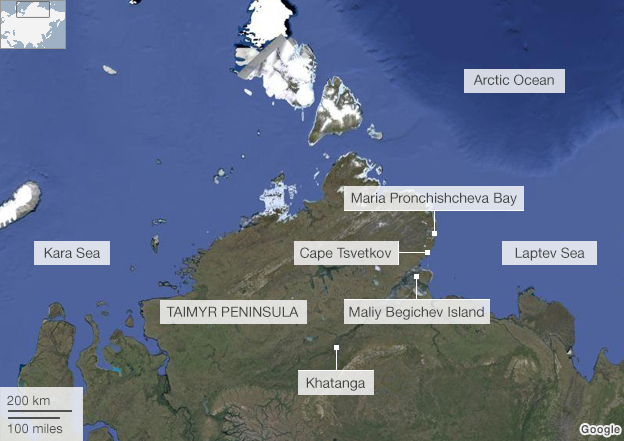 The Russian government says the country's future wealth depends on exploiting the deposits here and in other parts of the Arctic. The deposits will not be easy to extract, but they are almost certainly there. The melting sea ice has also opened up new shipping routes. Russia is now advertising the Northern Sea Route, which cuts the journey time from China to Europe by up to two weeks. "You save time and you save fuel. It is much more economical," said Alexander Olshevsky, head of the Northern Sea Route Administration. "Though you will need to pay for a nuclear-powered icebreaker, and of course you will need a boat that can deal with these conditions." But again, opening up the Northern Sea Route could disrupt the fragile ecosystem. More than 400 ships will make the journey this year - yet in 2010 it was only four. On our brief, two-week trip we have seen extraordinary fire-red Arctic skies, gleaming snowy owls and grumpy musk ox, and an almost untouched landscape of thin yellow tundra covering the permafrost. The temperature has barely risen above 10C and has often been closer to freezing. It is one of the last wildernesses of the world, a place few people even know exists, but modern industry is already starting to encroach on it. A day after the administration released the Hurricane Sandy Rebuilding Task Force progress report, three federal agencies have announced plans for remapping parts of the East Coast, where Hurricane Sandy altered seafloors and shorelines, destroyed buildings, and disrupted millions of lives last year. NOAA, the U.S. Geological Survey, and the U.S. Army Corps of Engineers are using emergency supplemental funds provided by Congress to survey coastal waters and shorelines, acquiring data that will update East Coast land maps and nautical charts. Using ships, aircraft, and satellites, the agencies will measure water depths, look for submerged debris, and record altered shorelines in high priority areas from South Carolina to Maine, as stipulated by Congress in the Disaster Relief Appropriations Act of 2013. 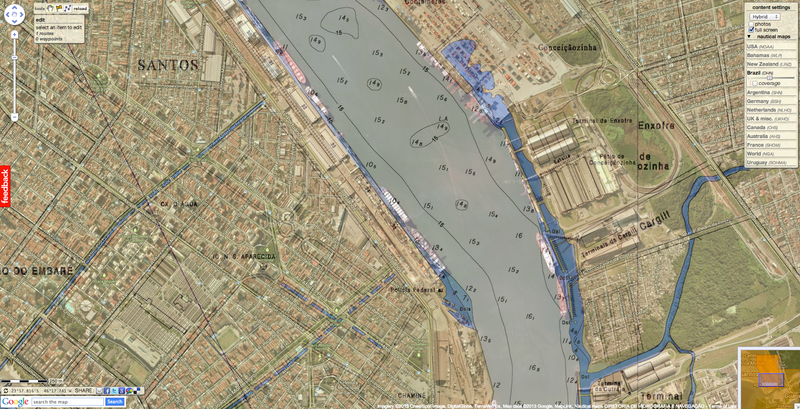 The areas to be remapped will be based on their relative dangers to navigation, effects from the storm, and discussions with state and local officials as well as the maritime industry. “Our approach is to map once, then use the data for many purposes,” said NOAA Rear Admiral Gerd Glang, director of NOAA’s Office of Coast Survey. 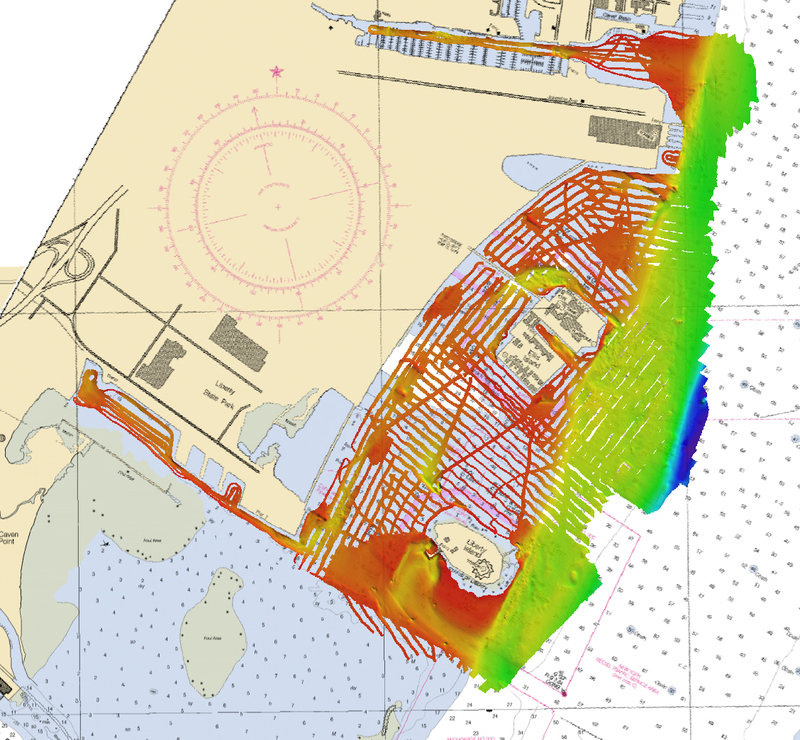 Navigation Response Team 5 prepared this graphic depiction of their surveys of Liberty Island and adjacent areas. The data, much of which will be stored at NOAA’s National Geophysical Data Center, and through NOAA’s Digital Coast, will be open to local, state, and federal agencies as well as academia and the general public. The information can be applied to updating nautical charts, removing marine debris, replenishing beaches, making repairs, and planning for future storms and coastal resilience. 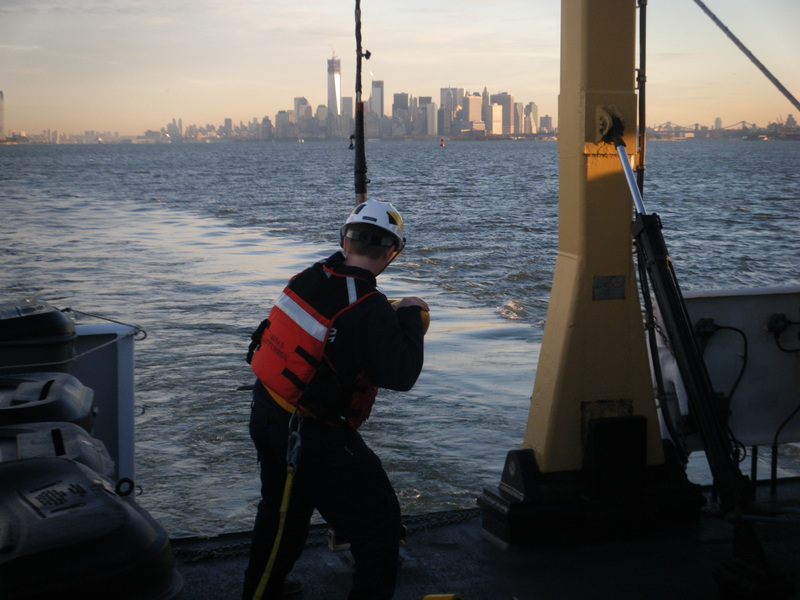 As the sun rose over New York on Nov. 1, NOAA Corps Ensign Lindsey Norman retrieved the side scan sonar that NOAA Ship Thomas Jefferson used to survey the Hudson River, allowing fuel barge traffic to resume. The three federal agencies are collaborating for greater topographic and hydrographic coverage and to promote efficiency. Earlier this year, a NOAA navigation response team surveyed the waters around Liberty Island and Ellis Island in New York harbor, measuring water depths and searching for debris that could cause a danger to navigation. Also, NOAA Ship Thomas Jefferson began surveying the approaches to the Delaware Bay in June. NOAA plans to contract with commercial firms for additional hydrographic survey projects and high resolution topographic and bathymetric elevation data and imagery in the region. The U.S. Geological Survey will collect very high-resolution elevation data to support scientific studies related to the hurricane recovery and rebuilding activities, watershed planning and resource management. USGS will collect data in coastal and inland areas depending on their hurricane damages and the age and quality of existing data. The elevation data will become part of a new initiative, called the 3D Elevation Program, to systematically acquire improved, high-resolution elevation data across the United States. Within hours of Sandy's departure, NOAA deployed research vessel Bay Hydro II to survey ship channels in the Hampton Roads area of Virginia, speeding the resumption of shipping and naval operations. “The human deaths and the powerful landscape-altering destruction caused by Hurricane Sandy are a stark reminder that our nation must become more resilient to coastal hazards,” said Kevin Gallagher, associate director for Core Science Systems at USGS. "Sandy's most fundamental lesson is that storm vulnerability is a direct consequence of the elevation of coastal communities in relation to storm waves. Communities will benefit greatly from the higher resolution and accuracy of new elevation information to better prepare for storm impacts, develop response strategies, and design resilient and cost-efficient post-storm redevelopment." The Army Corps of Engineers and its Joint Airborne Lidar Bathymetry Technical Center of Expertise are covering particular project areas in Massachusetts, Virginia, and New Jersey. They will coordinate operations, research, and development in airborne lidar bathymetry and complementary technologies for USACE, NOAA, and the U.S. Navy. There were at least 147 direct deaths recorded across the Atlantic basin due to Sandy, with 72 of these fatalities occurring in the mid-Atlantic and northeastern United States. This is the greatest number of U.S. direct fatalities related to a tropical cyclone outside of the southern states since Hurricane Agnes in 1972.